Almost a year ago I painted two owls. You can find that post here. I had such a block about finishing them that it has literally taken me almost a whole year to finish even one of them. My hubby had been asking me if he could have Mr. Owl for a long time and I finally decided to give it to him for Christmas. That meant I had to finally figure out how I was going to finish him! 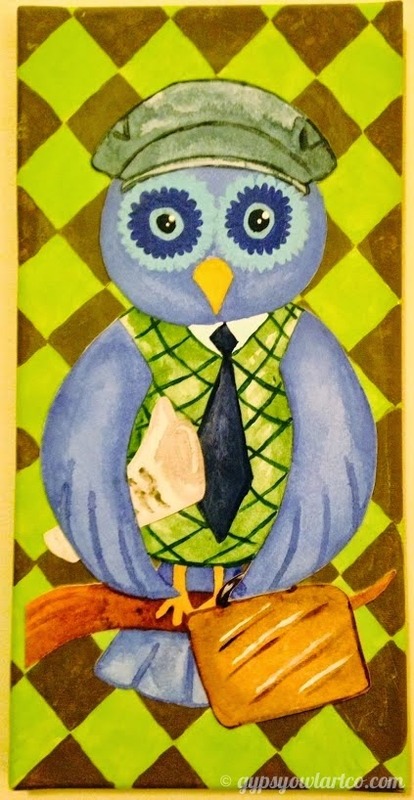 I pulled out my paints and stencils and used every bit of knowledge that I've learned this past year and gave Mr. Owl a pretty darn good make-over. Acrylic & Watercolor on watercolor paper collaged onto painted canvas. I adore how this turned out. It is so much more fun and I can see just how far I've come as an artist by looking at these 2 pictures. I used stencils, stamps, acrylic, and paint pens to complete. Needless to say, my hubby is thrilled with Mr. Owl and is most glad to have him as his very own! Let me stop right there because I honestly can't remember if I've ever shared my background as an artist. Once upon a time I was strictly an oil painter. And I was a considerable snob about it to. Abstract work (with the exception of Van Gogh who has always been my favorite), funky, fun, and different art appealed to me but was not something that I ever wanted to really do for myself. I also did a lot of portraits. After my eldest daughter was born, I didn't have time to paint. I was too busy with school, work, and trying to raise her. I did paint a few things during her early years but they were strictly for her - her name above her bed and such things. It wasn't until I was pregnant with my youngest daughter that I began painting again. I didn't want to get back into oil painting at that time and I was willing to try acrylics - and other stuff. I watched a ton of YouTube videos and would watch what others created, go buy those supplies and try to re-create the techniques. In fact, I still do that. But 2014 was truly my year to explode into my own as a "new artist", where I let go of all of my preconceived notions about form and realism, strict painting guidelines, and my overall stiffness. I started really having fun with my art. And as a result, my art has gotten more fun and funky. I am willing to experiment with new techniques & supplies, I'm willing to make a mess, I am willing to let go and just see where the muse takes me. Now, back to Mr. Owl. I think that my background was what was really holding me back. I just couldn't think of any way to loosen him up (or myself up). It still took me a little bit of time once I sat down to get in my groove. And I started as I usually start - by picking a color, dipping my finger in the paint and just rubbing it on the canvas. No brushes, no thought, just letting the muse move me where it will. And as we cruise full swing into January, I think that that will be my motto this year... "Just let it go". I know! I know! I'm sorry!!! I am singing it too. Don't hate me. But letting go is something that I have a huge problem doing - in my art, certainly, but definitely in my life. I am a control freak and I have the really bad habit of holding on to things so tightly that I metaphorically choke them. So this year, I am going to really try my best to have faith, breathe, and let things go. Life does take care of itself, if only you'll let it. And this year, I'm going to try my best to let go and let someone else steer for a bit. 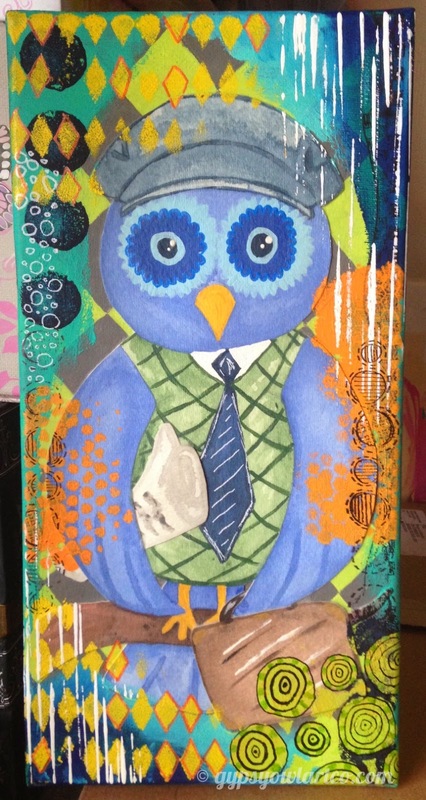 On that note, hope y'all enjoyed seeing Mr. Owl's transformation - next I need to work on Mrs. Owl.